This is the one! Really. It’s my inspiration piece. I promise. My designer told me to simlpy find a piece that I love and go from there. She said I would love the end result if I pick something (that I already love) to inspire me. Something. Anything. Hey! First, a brief thank you to everybody who supported the Autism Walk on Saturday. Great turn out . . . a good beginning! Some of the most common questions I get from clients concerns color. I’ll answer these questions by beginning with the color wheel. This is a tool, not only devised to help you select a main color but it also shows what accent colors to use. I have one client who carries her color wheel in her bag – at all times! 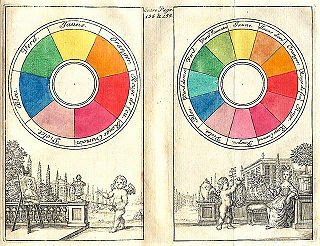 So, if you prefer using a shade, tint, or tone of one color (Monochromatic), the color wheel shows you that arrangement. 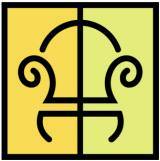 The term Analogous refers to colors that are adjacent to each other on the color wheel. And one of my personal favorites is a colorless palette using blacks, whites and greys called Achromatic. Keep in mind when you are selecting a color palette for yourself it is very subjective and personal. Keep it personal. If you don’t know what color scheme you like, look to your clothing for guidance. Do you wear browns, tans, cream and khaki? There’s a clue! The wheel will also help explain color relationships for Complementary, Diad, Triad, and Tetrad. Blah, blah, blog! Uh, perhaps a little too much information? Confession: I have never used a color wheel. Because I have an uncontrollable sickness for playing with color palettes, using a color wheel simply never entered my brain. But I have been told that many of you don’t share that enthusiasm (or disorder!) with me, so if you want “play with color ideas” pick up a color wheel and see what it says to you! The secret joy of the spectrum is to PLAY! SPECTRUM: 1. a band of colors, as seen in a rainbow, 2. a range of ideas or thoughts. Today’s blog will be devoted to color – but from a different angle. 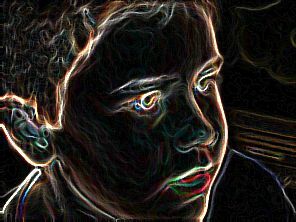 The dazzling neon colors in the photo above show the depth, the sensitivity, and the creativity of a boy with Asperger Syndrome. On the autistic spectrum this is just one diagnosis, just one of the colors in the spectrum. The Autism Society of America (ASA) has chosen the rainbow to represent the range of symptoms seen in autistics kids. Colors! Additionally, brightly colored puzzle pieces symbolize the struggle to understand and help these kids. SPECTRUM. Westdale Mall will be the place to meet and gather to support this cause on Saturday morning (April12) at 8:30. The goal, of course, is to raise awareness as well as funds. The money collected will stay in our community to help local children diagnosed with autism. Not a day goes by, I realize, that someone doesn’t ask for a donation for a worthy cause, but because April is National Autism Awareness Month I emailed my co-workers asking for sponsors. The result was immediate and overwhelming! WoW! It was then that I was overwhelmed. What color would you call humble? What hue is gratitude? Can you name a shade for generosity? Probably not. I like the idea of SPECTRUM – a band of colors and/or a range of ideas. So, I will simply say thank you for and from Lachlan. He is the glowing little guy in the photo – and he is my beloved grandson. Walk with me on Saturday – and (along with your snow boots) wear something colorful! The photo shows a dramatic, glamorous room done in black “leather” squares. It’s wallpaper. I have taken quite a bit of heat recently about even suggesting the use of wallpaper. Well, sometimes I don’t mind a little heat! But I find myself asking,”What happened to the idea that creative people are open-minded? !” I just can’t help myself about being unduly enamored with wallpaper. Okay?! that’s it – that is the closest thing to an apology you will hear from me. I am not giving up on these artistic papers. Nor should you. Honest to blog. Is there any viewer-interest in a few blogs on color? Or recent market trends? High Point markets open next week! 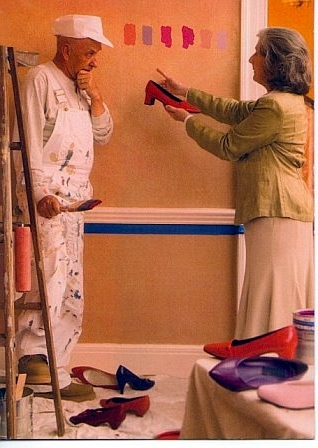 Spring (if indeed, it really does arrive) decorating tips? Alright, I’ll even accept a few more wallpaper insults!